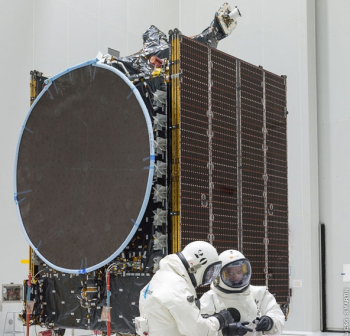 Arianespace conducted the fifth Ariane 5 launch of the year with the lofting of the Intelsat 37e & BSAT-4a satellites from Europe’s Spaceport in French Guiana on Friday. The attempt came after the rocket aborted on the pad due to an electrical issue with a booster post-main engine ignition. 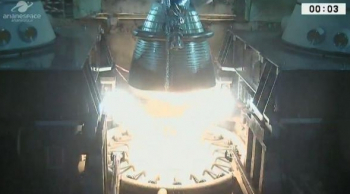 The abort stopped the boosters from igniting and allowed for safing to take place. The initial launch attempt was proceeding without issue as the countdown reached zero marking the point at which the Vulcain main engine ignites and ramps up during the seconds that follow. At that point the vehicle lights its two solid rocket boosters and lifts off from the pad. However, this time, for the first time since 2011, the main engine ignition was followed by a shutdown. No further details were immediately provided in the post-scrub comments, other than to say the new launch date would be decided in the coming days, after an investigation takes place. The delay lasted for two weeks in the end. Arianespace noted the issue was with the electrical system in one of the boosters. “Just after the ignition of Ariane 5’s main stage Vulcain engine, the on-board computer detected an anomaly affecting electrical equipment on one of the two solid-propellant boosters (EAP). This anomaly led to an interruption of the automated lift-off sequence,” said the company statement. The Ariane 5 was transferred to the Final Assembly Building (BAF) on Thursday, once the tanks had been purged. The two satellites, Intelsat 37e and BSAT-4a, were safe under the fairing atop the launcher. This mission was designated Flight VA239 in Arianespace’s launcher family numbering system. 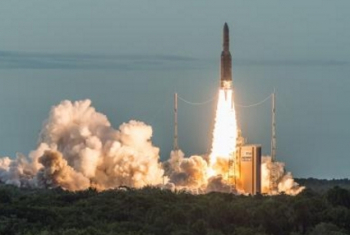 The fifth mission of the year was also be the eighth launch of the year for Arianespace. This is because Arianespace now enjoys a full family of launch vehicles. 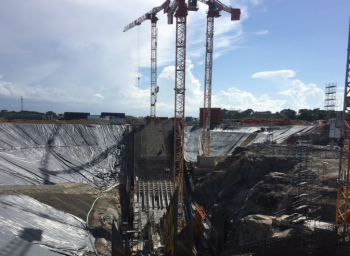 The new launch pad for the Ariane 6 rocket is taking shape at the spaceport, as seen in new photos tweeted in recent days. With its current fleet, Arianespace is targeting a total of 12 missions in 2017 utilizing its family of the heavy-lift Ariane 5, medium-lift Soyuz and lightweight lifter Vega. Preparations for the next mission saw the arrival of the two passengers set to ride uphill on the Ariane 5 rocket, a launch vehicle that was already deep into integration processing. 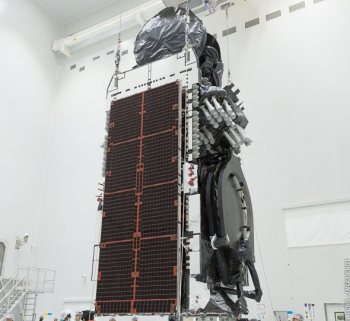 The BSAT-4a satellite, designed and built for Broadcasting Satellite System Corporation (B-SAT), arrived at the European Spaceport in Kourou, French Guiana last month. 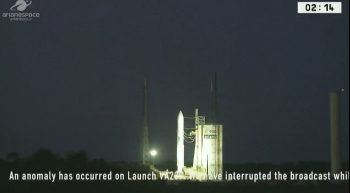 The other passenger for this dual launch was Intelsat 37e. This satellite was spotted leaving George Bush Intercontenteial Airport in Houston. It was a confirmed arrival at Kourou when Arianespace CEO Stéphane Israël tweeted a welcome message to the satellite. The launch follows closely on the heels of the previous Intelsat launch, which involved the lofting of the Intelsat 35e by a SpaceX Falcon 9 rocket from Kennedy Space Center’s 39A. 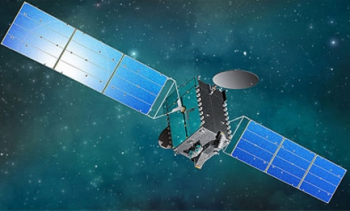 Total payload lift performance for the launch was approximately 10,838 kg., with the Intelsat 37e and BSAT-4a satellites deployed to geostationary transfer orbit during a flight that lasted 47 minutes. The launch mass was the second highest for Ariane 5, just slightly behind the record breaking 10,865 kilograms from the VA237 mission.